Welcome to Music City Arts Update, the online publication for Music City Arts Network! This arts-related blog provides news about career and life-changing opportunities for artists of all kinds. Please visit this site regularly for breaking news, feature stories, artist profiles, and photos. Follow us on the social networks @MusicCityArts. Send your arts news to info@MusicCityArtsUpdate.com. FAYETTEVILLE, Ga. (December 2018) -- Award-winning artist/instructor Gail McDaniel will teach a new eight-week watercolor painting course 22 miles south of Atlanta in the Peachtree City/Fayetteville area this winter. The course will be offered to beginning, intermediate and advanced artists on selected Thursdays starting Jan. 3, 2018 at Heritage Christian Church, 2130 Redwine Road in Fayetteville. Sessions will occur from 10 a.m.-1 p.m. on Jan. 3, 10, 17, 24 and 31, and Feb. 7, 14 and 21. The artist/instructor will provide insights on composition, value, color theory and application. She also will demonstrate some of the techniques that have helped make her an award-winning artist, including abstract under paintings, disappearing purples, painting on Masa Paper, white on white, monotype paintings, let it flow, texturize your paintings, portraits, reflective surfaces, and wax-resist Batik. The course is structured to serve artists at all skill levels, from the very raw beginner to the most advanced. McDaniel will close each session with individual critiques. Because space is limited for the classes, reservations are required. Tuition is $165 for eight class sessions. For more information or to register, contact the artist by phone at (678) 603-1502 or send an inquiry to gail@gailmcdanielart.com. Individuals can learn more about the artist/instructor and view her artwork at http://www.GailMcDanielArt.com and follow her at http://www.Facebook.com/GailMcDanielArt and http://www.Twitter.com/GailMcDanielArt. McDaniel is an acclaimed watercolorist who, by invitation, has served as an associate member and demonstrating artist/instructor for the prestigious Winsor & Newton Creative Artist Network of London. She was commissioned to create four program covers for Griffin (Ga.) Choral Arts' 10th anniversary concert season. Before moving to Georgia, McDaniel spent more than 20 years working as a professional watercolorist and art instructor in Nashville and Brentwood, Tenn. During that time, she taught more than 1,500 students in classes and workshops around the world. A number of her former students have developed into professional artists with exhibitions and commissions. "Like me, others love the look of watercolor paintings and want to learn the medium," said the artist, who painted the invitation cover for "A Little Night of Music" starring country superstar LeAnn Rimes. "Many come for the change of pace and the new, wonderful, relaxing challenge it brings. The intermediate and advanced students come to me to grow in the medium." Over the years, McDaniel has seen the positive change that comes over many people when they spend three hours with her, creatively thinking from the right side of their brain. "It's truly a night-and-day change, not to mention the fun they have," McDaniel added. "Many who come to me with no art background find they really have a true talent for painting. Some of them never had the slightest notion they had any talent. It's such an outstanding reward for them and a source of real pleasure for me." 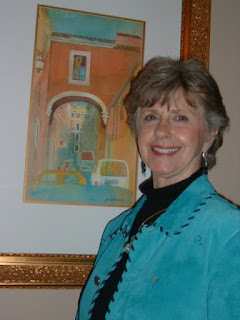 A good example is Phyllis Tatum, a watercolorist who studied with McDaniel for 14 years in Middle Tennessee. She and her fellow students were thrilled when she won four blue ribbons and a red ribbon at the Tennessee State Fair. Her crowning achievement came later when she won the fair's "Best of Show", a rare occurrence in watercolor circles. McDaniel fondly remembers receiving a thank you note from former student Suzy Foy of Boulder, Colo., who wrote, "My whole life I have dreamt about being an artist... I never believed I could live that dream, one painting at a time. Because of my nine workshops, mentoring and support (from McDaniel), it is happening." "One of the obvious results of classes is the togetherness that comes upon the group," McDaniel noted. "Friendships develop, and with that interest in each other's lives and the happenings and events in their world. The group watches children grow up, grandchildren being born, and members die. The group celebrates the joys together, as well as the sad times, giving special support. Sometimes, our paintings reflect those experiences." The classes near Atlanta should be no exception. McDaniel will demonstrate the techniques, shortcuts and concepts that she has developed or learned by doing, reading or studying with others. She plans to show her students everything she knows, holding nothing back. Her goal is to inspire them without making them feel overwhelmed. During her career, McDaniel has trained artists from 36 different states (including Alaska and Hawaii), the District of Columbia, Australia, Brazil, Canada, Guatemala, Japan, Mexico, the Philippines and South Korea. She has taught 11 workshops at historic Ghost Ranch in New Mexico, a landmark where the late Georgia O’Keefe lived and painted. She also served as a member of the arts faculty of Cheekwood Botanical Garden & Museum of Art. In 2002, she and her husband, Ken, launched the "Students and Friends of Gail McDaniel Awards", raising almost $90,000 for Middle Tennessee public schools. The fundraising effort earned Gail and Ken a nomination in the "volunteer innovator" category of the 2009 Mary Catherine Strobel Award. In 2012, the artist was named the PENCIL Foundation's "Volunteer of the Year". Before leaving Tennessee, she received an award for "Excellence in Community Service" from the Travelers Rest Chapter of the National Society of the Daughters of the American Revolution. She was inducted into the Cave City, Ky., Hall of Fame and named (as an eighth generation Kentuckian) to the Honorable Order of Kentucky Colonels as one of "Kentucky's ambassadors of good will and fellowship around the world." In 2001, she was invited by directors of the "Art in Provence" program to conduct an eight-day watercolor workshop in Dieulefit, France. She also has taught in Central America, South America, and Canada. She studied under 38 noted art instructors to help build her reputation as one of the South's top artists/instructors. -- even accepting a commission to paint a family landmark for former Kentucky Gov. Louie B. Nunn. Gail McDaniel's artwork was featured on the program covers of four major concerts in 2016-17 performed by The Griffin Choral Arts group. The choir, which is led by Artistic Director Dr. Stephen J. Mulder, is celebrating its 12th anniversary season. For more information about Gail McDaniel or to see her work, visit www.GailMcDanielArt.com. 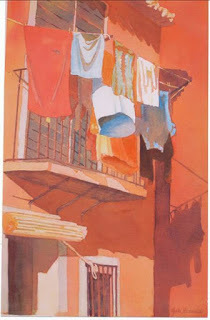 GRIFFIN, Ga. (December 2018) -- Gail McDaniel, an acclaimed watercolor artist/instructor who, by invitation, has served as an associate member and demonstrating artist/instructor of the prestigious Winsor & Newton Creative Artist Network of London, will lead an eight-week watercolor painting course this winter in Griffin, Georgia, near Atlanta. The course will be offered to beginning, intermediate and advanced artists on selected Wednesday afternoons starting Jan. 2 at Griffin First United Methodist Church, 1401 Maple Drive. Sessions will occur from 1-4 p.m. on Jan. 2, 9, 16, 23 and 30, and Feb. 6, 13 and 20. McDaniel will provide invaluable insights on composition, value, color theory and application. She also will demonstrate some of the techniques that have helped make her an award-winning artist, including abstract under paintings, disappearing purples, painting on Masa Paper, white on white, monotype paintings, let it flow, texturize your paintings, portraits, reflective surfaces, and wax-resist Batik. The course is structured to serve artists at all skill levels, from the very raw beginner to the most advanced. McDaniel will close each session with individual critiques. Because space is limited for the classes, reservations are required. Tuition is $165 for eight class sessions. For more information or to register, contact the artist by phone at (678) 603-1502 or send an inquiry to gail@gailmcdanielart.com. Individuals can learn more about the artist/instructor and view her artwork at http://www.GailMcDanielArt.com and follow her at http://www.Facebook.com/GailMcDanielArt or http://www.Twitter.com/GailMcDanielArt. "Participants are encouraged to paint their own choice of subject matter, in their own style, at their own speed, all the while being challenged to work out of their comfort zone and having fun along the way," said McDaniel, who was commissioned to create four program covers for Griffin Choral Arts' 10th anniversary concert season. "My classes provide opportunities for artists to develop their skills and find success. Before moving to Georgia, McDaniel spent more than 20 years working as a professional watercolorist and art instructor in Nashville and Brentwood, Tenn. During that time, she taught more than 1,500 students in classes and workshops around the world while raising almost $90,000 for student arts supplies through the "Students and Friends of Gail McDaniel Awards." "The Griffin area has a host of artists, so it's the ideal community to teach classes," McDaniel added. "I'll be demonstrating the techniques, shortcuts and concepts that I have developed or learned by doing, reading or studying with others. I show my students everything I know, holding nothing back. My goal is to inspire them without making them feel overwhelmed." During her career, McDaniel has trained artists from 36 different states (including Alaska and Hawaii), the District of Columbia, Australia, Brazil, Canada, Guatemala, Japan, Mexico, the Philippines and South Korea. She has taught 11 workshops at historic Ghost Ranch in New Mexico, a landmark where Georgia O’Keefe lived and painted. In 2002, she and her husband, Ken, launched the "Students and Friends of Gail McDaniel Awards. The fundraising effort earned Gail and Ken a nomination in the "volunteer innovator" category of the 2009 Mary Catherine Strobel Award. In 2012, the artist was named the PENCIL Foundation's "Volunteer of the Year". The couple also hosted fundraising events such as the "Chase Away The Blahs Party Artistically" benefiting school children in their Franklin, Tenn., home and the "Building Bridges Through Art" exhibition at CharacterEYES Boutique in Franklin, Tenn., benefiting Bridges Domestic Violence Center. McDaniel gained international notoriety in 2001 when she was named an associate member of the Winsor & Newton Creative Artist Network in London, England, and invited by directors of the "Art in Provence" program to conduct an eight-day watercolor workshop in Dieulefit, France. She also has taught in Central America, South America, and Canada. She studied under 38 noted art instructors to help build her reputation as one of the South's top artists/instructors. -- even accepting a commission to paint a family landmark for former Kentucky Gov. Louie B. Nunn. Other commissions have included painting the invitation cover for "A Little Night of Music" starring country superstar LeAnn Rimes; 13 pieces for the annual Nashville Scene N-Focus social calendar; and a promotional streetscape of four homes for Newmark Homes and five other paintings for the Nashville Home Builders Association/SunTrust Bank 2001 "Parade of Homes." The artist has showcased her original paintings at 56 solo exhibitions. She also has served as a member of the arts faculty of Cheekwood Botanical Garden & Museum of Art in Nashville, teaching weekly art classes. She created and painted the design for the theme poster and t-shirt for the Nashville Symphony’s "Italian Street Fair" two years in a row. "Griffin has a wonderful arts community, and I'm delighted to contribute," McDaniel said. NASHVILLE, Tenn. (December 2018) -- Fifteen singer-songwriters will take the stage in Nashville on Dec. 8 (Saturday) for the annual "Tunesmithing: Celebrating the Holidays." 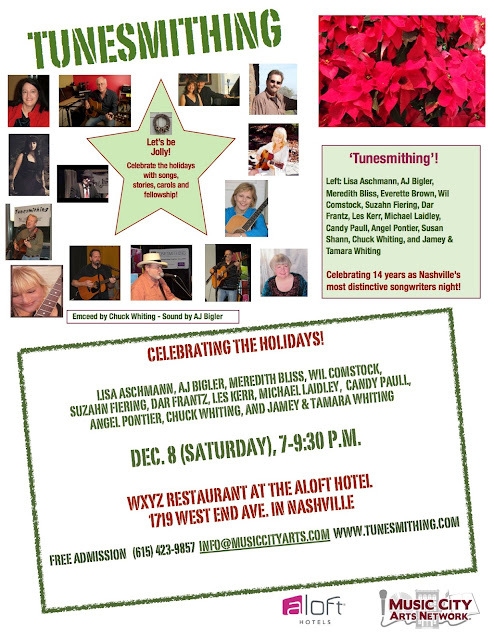 The special show will occur from 7-9:30 p.m. at WXYZ Restaurant/Bar at the Aloft Nashville West End Hotel, 1719 West End Ave. Attendees will enjoy original and classic holiday songs, poems and/or stories by Lisa Aschmann, AJ Bigler, Meredith Bliss, Everette Brown, Wil Comstock, Suzahn Fiering, Dar Frantz, Les Kerr, Michael Laidley, Candy Paull, Angel Pontier, Susan Shann, Chuck Whiting, and Jamey & Tamara Whiting. Nashville composer/educator/publicist Chuck Whiting will emcee the show. Songwriter/audio engineer AJ Bigler will handle sound. "Tunesmithing" songwriters showcase is sponsored by Music City Arts Network and Shine Time Books and Music. Admission is free. Food and beverages will be available for purchase. The monthly show was founded in 2003 to spotlight emerging, professional and hit songwriters, as well as artists of all kinds. The event offers mentoring, career growth and networking opportunities for artists at all levels.